Happy Wednesday! I originally wanted to get this blog post up yesterday, but it’s been such a crazy week! I know I’m a day late, but I’m linking up with Marcia from Marcia’s Healthy Slice, Erika from MCM Mama Runs and Patty from My No-Guilt Life for Tuesdays on the Run. This week’s topic is Your Running BHAG (Big Hairy Audacious Goal). When sitting down to write this post I realized that I don’t really have a BHAG. Do I run for PRs? Not exactly. Don’t get me wrong, a PR is great and always appreciated, but I don’t train for one. Do I want to run an ultra? HELL NO and I never see one of those in my future. What about a triathlon? Nope because open water swimming for an extended period of time freaks me out. Okay, so what running goals do I actually have? I’d love to run a half marathon in 25 states. I’ve never wanted to visit all 50 states, but I think that 25 is way more realistic (and affordable) for me. I set this challenge for myself back in 2016. I don’t have a time frame for when I want to accomplish this, but I figure if I can run in 2-4 new states per year, that would be fine. I’ve already mastered the racecation so this is just an added bonus. Based on the 25 states I’ve selected, I still need to run a half marathon in Arizona, Colorado, Florida, Georgia, Hawaii, Louisiana, Maryland, Michigan, Minnesota, North Carolina, Tennessee, Texas, Washington, Wisconsin. If you have any race suggestions for those states, let me know! I will continue to enter the lottery for the London Marathon until I get in, lol. I visited London for work a few years ago and I really enjoyed my time there so I’d love to run the marathon there. I’d also love to run a race in Toronto, and maybe a tropical race in Bermuda or the Bahamas. It would just be nice to explore a new country on foot! Finally, and most importantly, I want to continue to run smart so that I can still run when I’m in my 60s, 70s, 80s and beyond. This is probably the most important goal of all! I think running a half in 25 states is a BHAG!!! I definitely would love to do some races in other places – I AM hoping to run Ragnar Napa Valley in Nov! Thanks friend! I guess since the 25 states thing is over a length of time , I never considered it a BHAG, but maybe it is! YESSSSS COME TO TEXASSSS!!!!! We can run a race together! Austin has the 3M half (net downhill) the Austin Half (which I hear is pretty tough) or we can go to San Antonio for RNR San Antonio 🙂 :). I would love to do RnR San Antonio. Not sure I can get down there this year but maybe next year! I heard the 3M half is pretty cool too! Yes, please come to Texas! Eventually I would like to run a marathon and an official half marathon (I trained for a half a couple years ago but decided to just run it at home on my own). I would say don’t cross a triathlon off your list because I’ve seen some that you swim in a pool and not an ocean or lake. You already run and cycle so it’s not too far off. Thanks for the advice about the triathlon. I forgot that some have the swim option in a pool. I think that as long as you are mentally prepared for the training, you can definitely do a marathon or half marathon. Tha’ts my one ultimate goal too. I’m (hopefully) in this for the long haul. I’d love to continue doing marathons, but if I do one a year (or even every other year), I’m fine with that. Just knowing I can go the distance is pretty nice 😉 I do want to run a race in every state, but I have no preference on distance (though I do prefer 13.1’s if it’s available). I kind of feel the same way about marathons. I’m not really sure if I want to do any more, but if I do, it will probably only be once a year or every other year like you said. Oooh I’ll come with you to any of those but especially Arizona. Wanna do the Phx Marathon in February? Not this February but maybe next? For Minnesota, run Grandma’s. For Wisconsin you could do the Door County one that Wendy does. Grandmas is on my short list for Minnesota. The one is Wisconsin sounds cool. I was thinking about RnR Arizona because you get to run through 3 cities. Not sure if I could do Phoenix because it’s downhill and it would kill my quads! I think halfs in 25 states is a fantastic BHAG! I’m always perplexed at how there are people who do all 50 states. Besides the expense, how do they find the time??? Me too! I could never spend that much money on travel. I know some people that have completed the goal rather quickly – in 1-2 years, that’s crazy! I think running a half in 25 states counts as a BHAG. That’s a lot of halves! If you want to run a medium-sized race, the first half I ran was in College Station, TX. It was called the Armadillo Dash at the time but I know they changed they name – it might just be the BCS marathon/half now? It’s a fun small town race and you’re still pretty close to the big cities for sightseeing! I think 25 states is a great goal – sounds BHAG to me! 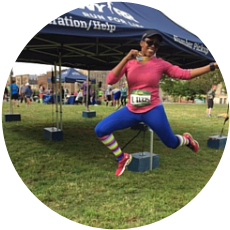 I don’t think I really have a BHAG – I want to run a marathon and after that, I just want to keep running into my 60s, 70s – for as long as my legs will carry me! I think that’s a great BHAG! I’m excited to cheer you on when you start marathon training. Love this!! And I love the idea of running half marathons in 25 states! Now that my IM is over, I am working on my next big goal, so I love your ideas!! Can’t wait to see your next big goal! Wow 38 marathons – that’s amazing! I think these are great goals! I am also not interested in a tri, but I do think one day I’d like to consider an ultra. We’ll see though. I hope you make it around to at least 25 states! Thanks Lisa! I’m hoping I can complete the 25 state challenge eventually. I don’t have a BHAG but can I steal yours? I am running in Montreal in Sept and Paris in Oct… so excited. I really love racecations! Such a great way to explore a new city. Running in 25 states sounds amazing! I love running wherever I travel and I’d love to do more racecations, I’ve just never made a specific goal! I hope you get to do more international races! I’m totally in love with racecations so that helped me to make the decision to try and run in 25 states, lol. Well, I have no desire to even run a marathon . . . I do want to complete all 50 states. Unfortunately the next few years look rather dicey in being able to add states, but you never know. I do enjoy training hard in the hopes of a PR — and I’ve had a pretty amazing “run” after an overly long drought, but that too shall pass, as all things do. Running the rest of my life is definitely my goal! Running for life is my ultimate all time goal. I would be sad if I couldn’t do it, thats for sure. That is a great goal, and attacking a few each year sounds so doable! I would love to do some sort of race in each state, and my dream is to race in Italy, Costa Rica and Greece! Thanks! I wanted to make sure it goal didn’t add an extra stress to my life so a few states a year is more realistic to me. Great BHAG! It doesn’t have to be nuts, just something that will challenge you and make you work toward what you believe is happiness. I love it. Good luck planning and checking off some 13.1 states! That’s so true. Thanks for putting that into perspective. Oh I’ve heard of that one before, I’ll check it out – thanks! Florida seems to have a ton of great options for races!